EESPA commissioned this fifth annual survey among its members as part of a continuing commitment to supporting the rapid market growth of e-invoicing and to play its part in monitoring take-up. The majority of invoices processed were B2B or B2G (Business-to-Business or Business-to- Government) invoices (1265 million invoices in total in 2017), although the EESPA membership also has a significant involvement in the delivery of B2C (Business-to-Consumer) invoices (719 million invoices in total in 2017). This year for the second time we have received responses to the question contained in the Survey ‘what is the average value of an invoice processed by your firm?’ The figure derived from the relative limited range of responses was EUR 3,530 for B2B/B2G and EUR 165 for B2C. On this basis, the total value of the reported invoices processed was EUR 4.6 trillion. The survey: the results are based on a survey of individual EESPA members completed in June 2018. Members provided statistics on the basis of actual transaction volumes for the calendar year 2017 to a trusted third party who collected the individual figures on a confidential basis and calculated the aggregated volumes. EESPA members were asked to report the volume i.e. number of e-invoices delivered by them to buyers connected to their network or service, and also volumes delivered to buyers connected to another service provider. Each member was asked to carefully identify only truly electronic invoices, irrespective of the process through which the invoice or the invoice data were collected from suppliers. The average value of an invoice was provided by a number of respondents by simply dividing the total face value of invoices processed by the number of invoices processed for B2B/B2G and B2C invoices. The figures represent an indication of the total footprint represented by the EESPA community in relation to the growing volumes of e-invoices now being processed at the expense of traditional paper documents. The majority of EESPA members participated in the survey. A number of members were not able to participate for practical and policy reasons, and the sample size is therefore affected by this as well as the incidence of members joining and leaving the association. Some adjustment to the figures were undertaken to smooth out these factors. Given our insights into the volumes processed by non-participating members the overall volumes attributable to the EESPA community would, be appreciably larger. 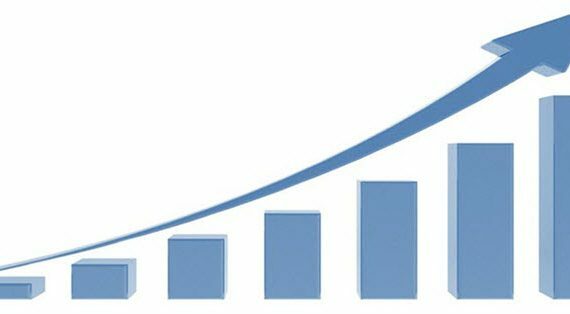 In 2017 the figures reveal an important growth in B2B and B2G transactions over the previous year, and the same for the B2C sector. 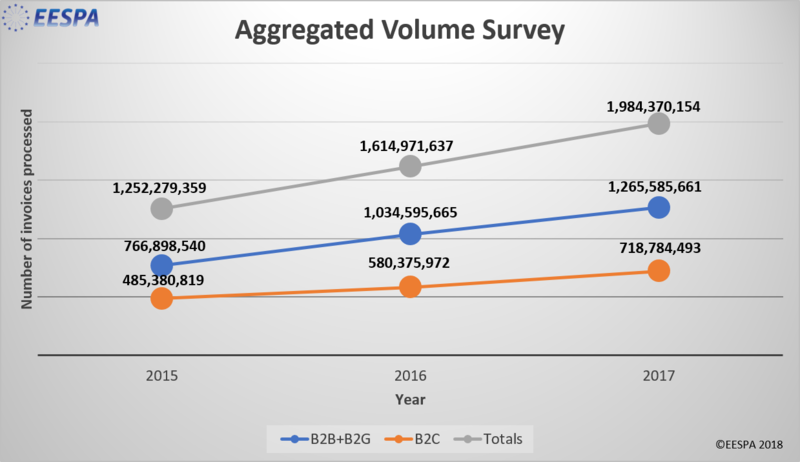 B2B/B2G volumes grew by 22.3% and 23.8% for B2C volumes. Given that we stand on the threshold of the move to e-invoicing by EU public administrations based on the provisions of Directive 2014/55/EU, the future should bring accelerating volumes based on the critical mass that is already evident in these numbers. EESPA service providers are making a very significant contribution to the adoption of electronic invoicing across Europe and globally. Service provider networks and services to buyers and suppliers contribute a growing and sizeable element of total electronic invoice volume and these services are more often than not preferred to direct connections between suppliers and buyers. EESPA: EESPA was formed in 2011 as an international not-for-profit association. It acts as a trade association at a European level for a large and dynamic community of e-invoicing service providers, drawn from organisations that provide network, business outsourcing, financial, technology, and EDI (electronic data interchange) services. It focuses on public policy and compliance issues, the creation of an interoperable eco-system and championing the widespread adoption of e-invoicing for the benefit of economic efficiency and growth.